Portuguese Heritage Publications announces the release of its latest publication, the luxury edition of the book “IV International Conference On The Holy Spirit Festas”, a hard cover, full color, 100+ page, photojournalist’s report of the June 2010 conference in San Jose, California, by Miguel Valle Ávila, assistant editor of the Portuguese Tribune newspaper. Photojournalist Miguel Ávila documents the events and personalities who made the IV International Conference on the Holy Ghost Festas a memorable event for the Portuguese communities around the world where “Festas ao Divino Espirito Santo” are held. In this publication you will find Miguel’s fine selection of beautiful photographs from his portfolio of over one thousand photographs taken during the four days of the event. 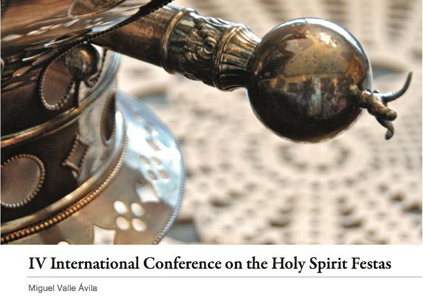 Inspired by the Holy Spirit’s message of peace and love, motivated by the desire to honor the pioneers of these celebrations and determined to honor the people who keep them vital to our cultural imprint, researchers, historians, theologians, artists and volunteers from organizations around the world gathered for three days in San José, California, in June 2010 to deepen the understanding and share the experiences of this religious and cultural phenomenon that unites Azoreans everywhere. For us, Azoreans in every corner of the world, it was the love of and devotion to the Holy Spirit that ameliorated the shock of the cultural changes, soothed the pain of the uprooting and welded the Azoreans of different islands into one single community. Coordinated by Portuguese Heritage Publications of California, the IV International Conference, held in conjunction with the 96th festa organized by the I.E.S. of San José, garnished the sponsorship of the Portuguese community of California, the Direção Regional das Comunidades of the Regional Government of the Azores and dozens of companies and individuals determined to maintain the uniting embrace of these celebrations, the largest and most visible of all the Azorean cultural and civic manifestations in the world. Highlighting the impact of these celebrations in the arts, an exhibit of paintings, photography, queen’s capes, historical crowns, jewelry, ceramics, and crystal by Portuguese-American artists was inaugurated during the conference and open to the thousands who participated in the 2010 I.E.S. festa. Miguel Ávila, an accomplished photographer and Assistant Editor of The Portuguese Tribune, dedicated four days to documenting, with insight and emotion, every aspect of this conference. From that labor of love, from which he archived almost 2,000 photos, he created this album capturing the essence of the conference – the happiness in the sharing of experiences, the emotions evoked by the saudade of past festas, the pageantry of the parade, the beauty of the exhibit, the solemnity of the coronation Mass at the Portuguese National Church of the Five Wounds and the warmth of the presence of thousands who participated in the celebrations, with special care to document the involvement of the younger Portuguese- American generation. For just $32.00, you will own the definitive photo album souvenir of the IV International Conference, including photos of the many queen’s capes, historical Holy Ghost crowns, artworks by some of the best Portuguese-American artists, the IES parade, the mass at the Portuguese National Church of the Five Wounds, and more. This is a must have book for every Portuguese home, especially for those who participated, or attended, any of the events during the conference.